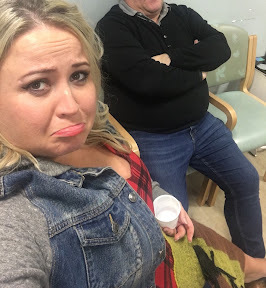 RIVER City and Gary Tank Commander actress Leah MacRae proved the show must go on - performing from a wheelchair after dramatically snapping her Achilles' tendon during her stage show. The Scots actress was walking off from the first half of My Big Fat Fabulous Diary at Eastwood Park theatre when she heard a loud noise. 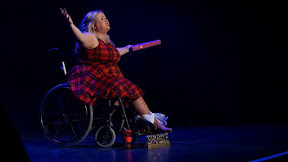 And despite the theatre's medical staff advising her to go straight to A and E, Leah proved to be the real trouper and insisted on performing the second half in a wheelchair before heading to hospital. Leah said: "I heard a big bang, like a whiplash as I went off stage and the next thing I knew I couldn't walk properly. The audience and my crew didn't have a clue what happened and for a minute or two I was behind the stage feeling dazed and upset. They wanted me to go to hospital straight away but I just said I wanted to finish the show." Leah went back on stage in a wheelchair after an announcement was made saying there had been an issue. Leah who has had now rescheduled the rest of her May performances was rushed from stage to the Queen Elizabeth University hospital in Glasgow. She said: "I do a lot of exercise and thought I'd just sprained my tendon but the doctor told me it was ruptured and pretty serious and that I'd have to be plastered up for a number of months." I've now got a lovely big cast on my left leg and had to tell the River City producers who were brilliant and said they'd work round it. Everyone had been lovely and the theatre and hospital were great with me so I'd like it thank everyone. The rescheduled dates for the show are the Village Theatre East Kilbride:, Friday 4th August and Rutherglen Town Hall Sat 5th August.